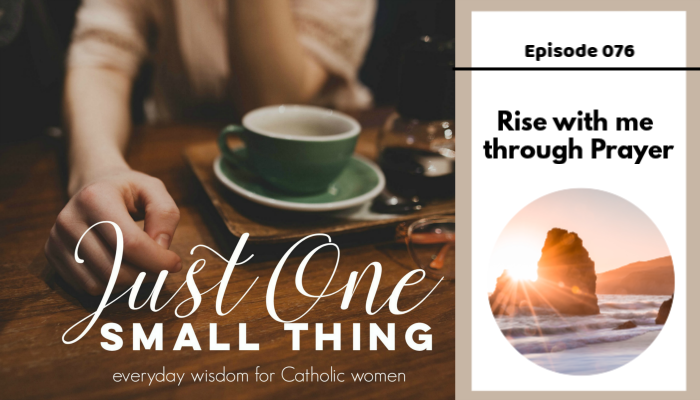 This week the Just One Small Thing Podcast is a challenge for you (and for me!). Since we are in the Easter season I think it is the PERFECT time to take stock of life and our faith life. Have we been moving forward? Do we actually, deeply believe the things we processed during Holy Week and on Easter Sunday? And, perhaps as important as anything, am I committed to prayer? Because, as I have learned over the last year, it all comes down to prayer. In the podcast I take you on a bit of a journey of thought with me (hopefully the path isn’t too twisting!). In recent months I have discovered that it ALL COMES DOWN TO PRAYER. I realized this while thinking up (nearly 200 episodes now) the Catholic Sprouts Podcast. When I challenge kids to do something at the end of each episode, it really doesn’t make sense to challenge anything but prayer. I also felt this hit home as I learned about the early Christians and that first Easter Sunday. And, so, if you feel called to deepen your prayer life…or finally really learn how to pray, I would like to invite you consider joining the PRAYER COURSE from Catholic Sprouts. The course is open for enrollment right now. In the course you learn Why we need to pray, How to pray, When to pray, and How to combat the struggles we all face with prayer. And not only this, but you will be part of a community of women also learning to deepen their prayer life. But, I will only be enrolling students this week (ending April 29th, 2019). At that point I will be closing the doors and starting the course. When you join the Catholic Sprouts community, you not only will be part of a thriving community of over 11,000 Catholic Parents, but you also will get instant access to the Catholic Family Digital Resource Library. Simply head here to sign up! Today we are getting back to a topic I love: The Rosary. Over a year ago I put a little rosary booklet with the help of Annie from Paper Monastery. The Rosary Booklet is a collection of ways to pray and reflect on the rosary. Over 3,000 copies of that book have been shipped all over the world (holy cow! ), but more importantly, just putting that book together has had a big impact on the way I pray this incredible prayer. And through that, of course, changed my entire life! My favorite thing to reflect on while praying the rosary are the Virtues of the Rosary. Many saints, including St. John Paul II, Mother Teresa and Padre Pio all attached virtues to the rosary and I have found that reflecting on these virtues helps me not only understand the Gospel story, but also helps me apply these things more directly to my own life. So, today we are digging into the Glorious Mysteries. The virtue for the first mystery, the Resurrection, is FAITH. We can talk about Faith (the Catholic Faith, meaning our set of beliefs) and faith, like being faithful and trusting. Both of these are so important, and so deeply connected. Our Faith rests on the reality of the resurrection. We are an Easter People and we really do have to investigate if we FULLY believe that these things happened. I also talked about how we can reflect on the “faithful” with this virtue and pray at all of the divisions in the Catholic Church be healed, and we really become the mystical body of Christ. Finally, I looked at how pregnancy, birth, and raising a baby is SUCH a time fo faith, and how faith and trust are so linked. I hope you found this helpful! And, if you want to reflect a bit more on the Virtues of the Rosary, I encourage you to download and use these pretty coloring pages I made! Completely free, just follow the link, sign up, and they will be in your inbox! 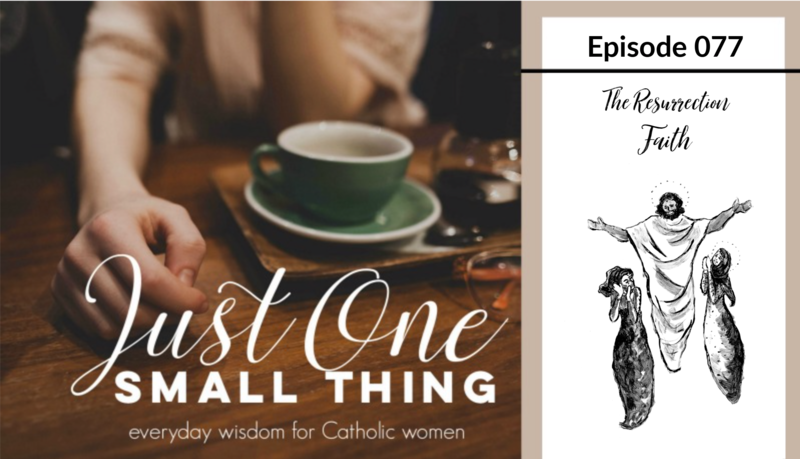 J1ST 074: The Just One Small Thing Podcast Is BACK!! Thank you to all of you that have sent sweet little emails or left encouraging comments! The prompted me to get back on creating this podcast, and once I started recording I realized how much I had missed it! 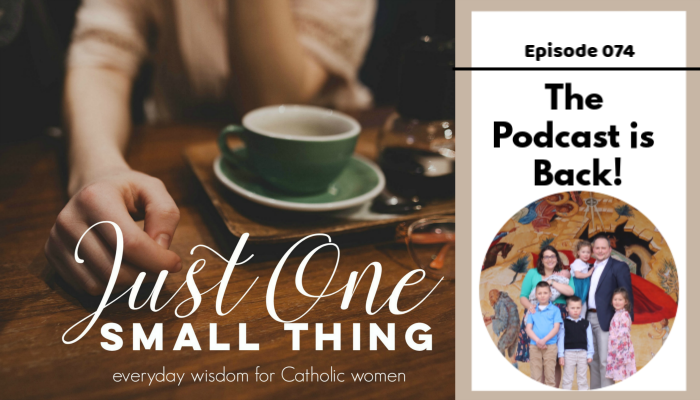 So, I am very happy to announce that the Just One Small Thing Podcast is BACK! The plan (God willing, of course) is to get back into weekly podcasts here. I will continue to produce daily content for the Catholic Sprout’s Podcast as well. But, this podcast will be longer (20 to 30 minutes, unless I run out of things to say!!) and come out once a week, on Sunday evenings. We welcomed George Blaise to the family on February 13th. He is doing great, and I feel like a first time mom! Seriously! I don’t remember anything from my other babies, and I (still) am not a natural mother. Love my babies, but still don’t really know what I am doing!!! I have decided to stop (for now) creating videos for the Catholic Sprouts for Moms Youtube channel. It’s just not something I can really swing during this season of life! You know, being showered and in a quiet house during DAYLIGHT. Yup, not happening! Create content that lets other Catholic Mothers that they are NOT ALONE, both in life and in their failures. I fail SO OFTEN! Supply listeners with gentle reminders. And I’ve realized the only real reminder that we need is to pray. So much more on this coming soon. And finally, I hope to bring listeners just a little bit of joy. I plan to have on some great guest as well, so when I run out of goodness, I will look to them! Thanks for sticking around, and it feels so good to be back!! It’s time to get excited about our Catholic Faith, because it really is so awesome! 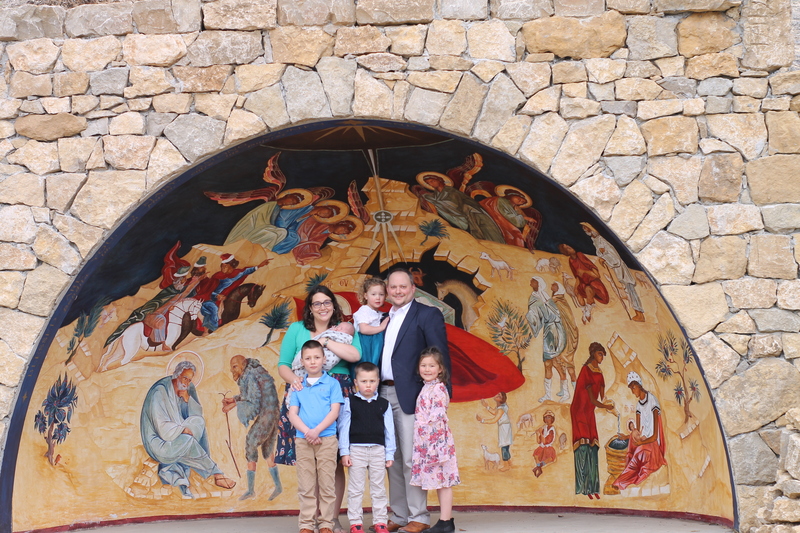 There is so much to be excited about with our faith–and the extra bonus is that the more excited we are about our faith, the more our KIDS will fall in love with the faith! So, I hope this video gets you excited. I don’t go into deep detail here, but I do have a free download of all the things I touch on here so you can dig in deeper if you’d like. 10 reasons it’s awesome to be Catholic! I hope you enjoyed this video, and I would LOVE to hear what you would add to this list! There are so many more things I wish I could have added!!! As a modern mother we are constantly struggling between two extremes: Trying to be a Super Mom and failing, and then falling into guilt and self-loathing. But, this is not the vocation we are called to as mothers. There is a better way for us Catholic Mothers and the model for this better way is St. Therese. The Little Way of St. Therese is path to holiness for the rest of us. Instead of climbing a mountain to holiness, it is like riding an elevator, which is the very arms of Jesus Christ. And the little way is really the KEY to being the mother you were created to be!! The little way to holiness is a reminder that if God put the desire for holiness–and to be a good mother–then because he is a good and just God there will be a way to do this. In order to walk this Little Way of Motherhood, we need to stop trying to be and do everything and instead, Let Go and Let God. The little way also reminds us that the little things matter–and as mothers our live is FULL of little things like diapers and dishes. Each of these little things is an opportunity to love. And to God, nothing is little. Everything matters and everything is important to God. Make sure to listen to the DAILY PODCAST FOR CATHOLIC KIDS! And, join us on Facebook!!! Thanks for being here–and don’t worry! Motherhood is HARD! We are all making mistakes each and everyday. But keep fighting, keep working, and keep praying!